Events at work conspired to see me sent home early today. So fortune smiles - I can once again do a live-tweet commentary on League of Assassins before writing the latest entry for the Arrow Episode Guide. 0:02 - I think it's anatomy Ollie knows, not biology. 0:07 - Give Ollie points for asking the question even though it's obvious that no, Laruel is NOT Ok.
0:09 - Ah, the fine #GreenArrow #BlackCanary condition of improvised weaponry. 0:12 - Tradition. Not condition. I'm tired. 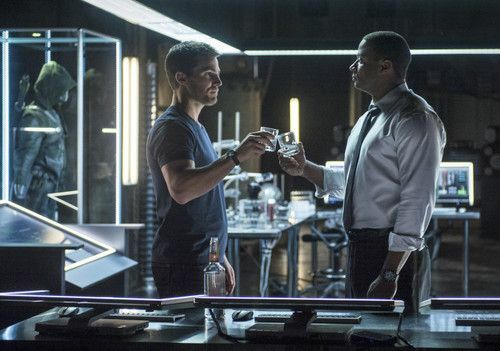 0:15 - Waiting for Diggle to remind Ollie about the LAST time he brought a love interest into the Arrow Cave. 0:18 - Retconning this so Sara was abducted in her underwear seems a little exploitative. 0:22 - Damn good fight scene, this. 0:27- Okay, now THAT was just gratuitous! The whole bare back scene! 0:30 - And that, ladies and gentlemen, is why Ollie is an awesome character when he lets the good man out. 0:36 - Nice to see that Quentin thought to mention his wife in all of this. 0:37 - Nice to see Quentin putting those detective skills to work...however painful the final conclusion. 0:40 - No one who says he's out to save the human race EVER has good intentions. Especially when he owns a slave ship. 0:43 - It would be kind of awesome if #RoyHarper winds up saving Laurel from a drug overdose. 0:45 - Very heavy @GailSimone influence on tonight's #Arrow. Lots of things borrowed from Sensei & Student. 0:48 - How many of you saw 'Follow Your Arrow' trending and were surprised it had nothing to do with #Arrow or #LeagueOfAssassins? 0:59 - Well... some answers but still some mystery regarding the past. As it should be. Great episode.